Recently Amazon added the functionality to order almost any product it offers through the Amazon Echo. Here’s how to set it up and begin doing some online shopping with nothing but your voice. Previously, the Echo was only able to re-order products that you already purchased in the past, as well as order a handful of select products. However, the selection has been expanded to include pretty much everything on Amazon’s website. The main caveat is that whatever you order using the Amazon Echo must be offered through Amazon Prime. Some categories are also ineligible, including apparel, shoes, jewelry, watches, Amazon Fresh items, Amazon Prime Pantry items, Amazon Prime Now items, and Add-On items. Other than that, you can go crazy and order all sorts of stuff right from your Amazon Echo. Here’s how to get started. 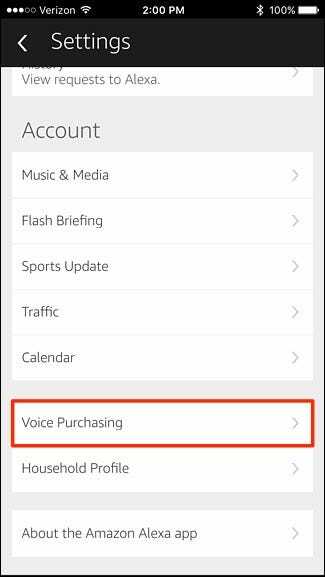 First off, you’ll need to turn on voice purchasing, which allows you to order products on Amazon through the Echo in the first place. 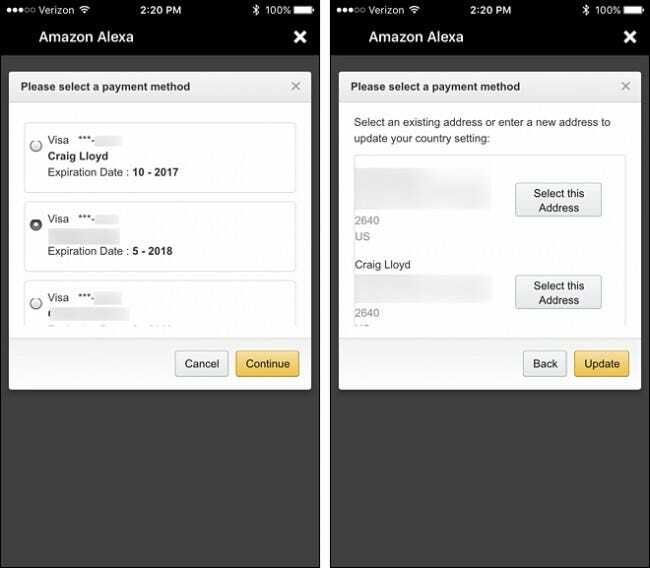 You can also set up a four-digit PIN code of sorts that Alexa asks for when you buy something on the Echo, to prevent other people from spending your money. 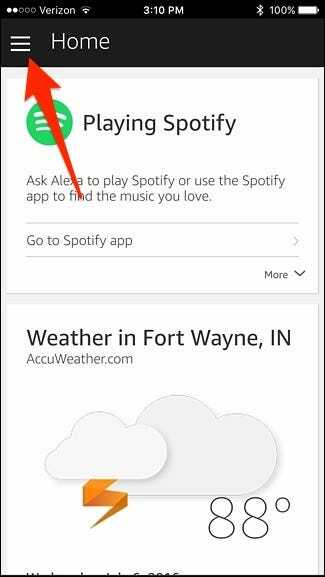 Start by opening up the Alexa app on your phone and tap on the menu button in the top-left corner of the screen. Select “Settings” from the list. Scroll down and tap on “Voice Purchasing”. Tap on the toggle switch to turn on voice purchasing if it isn’t already. 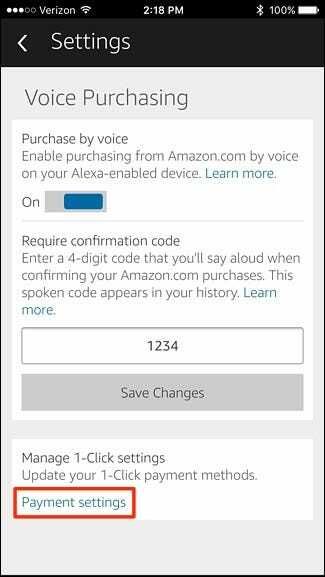 That’s all you need to do to enable voice purchasing, but if you want to prevent others from ordering items on the Echo, you can tap inside of the text box right above “Save Changes” and enter in a four-digit PIN code. This can be comprised of either letters or numbers, or a mixture of both. Tap on “Save Changes” when you’re done. 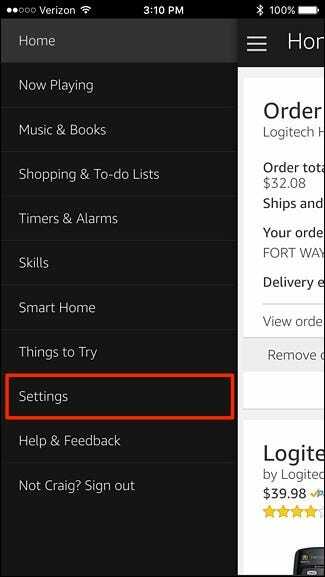 It’s also a good idea to check your 1-click settings to make sure the right shipping address and credit card will be used with voice ordering on the Amazon Echo. To do this. 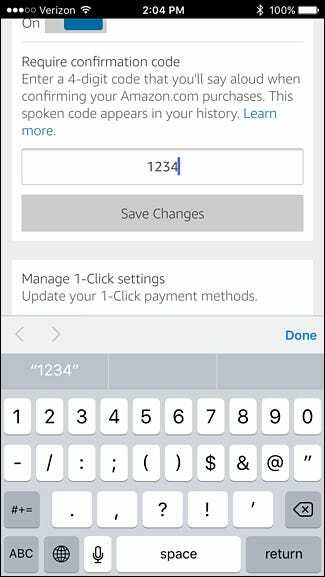 tap on “Payment settings” at the bottom. 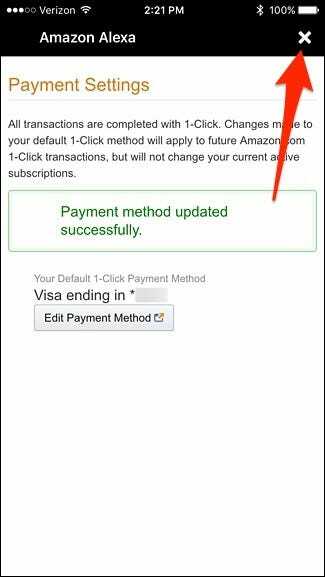 Tap on “Edit Payment Method” to make changes. Select the credit card and then the correct shipping address that you want used for voice purchasing. 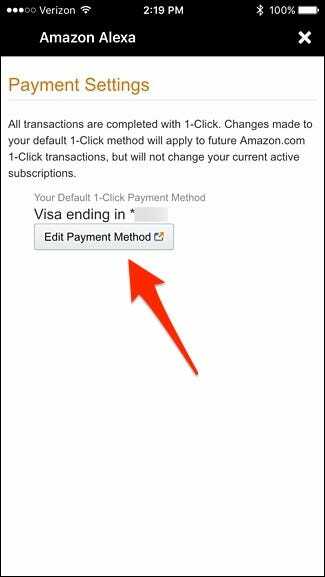 Once you’re back on the “Payment Settings” screen, tap the “X” button in the top-right corner to close it out. 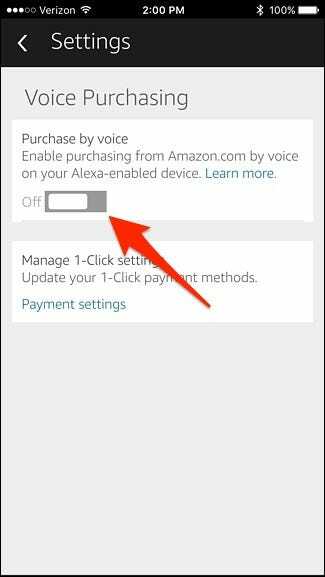 You can now exit out of the Alexa app and begin ordering items from Amazon using your Echo device. 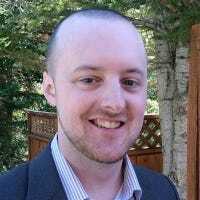 After you have voice purchasing set up, it’s time to use the power of your voice to buy things off the internet. All you have to do is simply say, “Alexa, order (product name)”. You can also say something more generic, like “Alexa, order dog food”. Alexa will then give you the top search result and if that’s not it, you can say “No” when it asks if you want to order it and Alexa will read off the next result. Simply say “Yes” when Alexa reads off the correct item and asks if you want to order it. You’ll then be prompted to enter in your your Voice Code if you have it enabled. 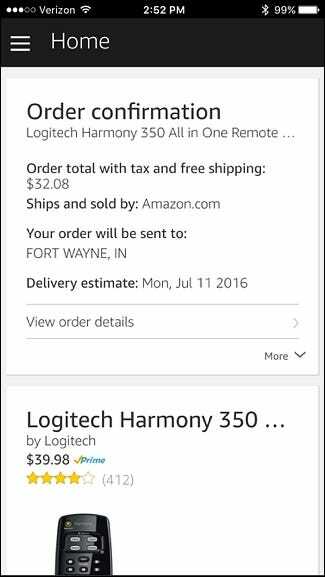 Once the item is ordered, the order details will appear in the Alexa app.